Although this line was new for me, Melik didn’t miss a beat and played the next few moves quickly: 13.Rb1 (13.Nxd4 is the main line) b6 (13…Bd7 is more popular) 14.Nxd4 Nxd4 15.Qxd4 Bb7 16.Rb3 Rc8. At this point though, he sank into deep thought and about 25 minutes later played 17.Qd6?!. It’s a somewhat understandable decision, as if White doesn’t try to trade now, he probably won’t get another chance for a while and White’s king will be in the center for a long time. 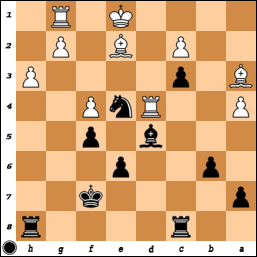 Black’s general idea on other moves is to play something like …Nf5 and …Rd8, maybe with …Nd4 or …Bd5-c4 to follow. But after 17…Qxd6 18.exd6 Nf5 19.Rb4 (else …Nd4 would be painful) Nxd6, White no longer has an extra pawn, is behind in development, and is saddled with a worse pawn structure. After 20.a4, it was my turn to take a long think for nearly 30 minutes. I wasn’t entirely sure what to do here – my first plan was to try and stick a bishop on e4, but tactically it doesn’t really work after Rd4 and Ba3. 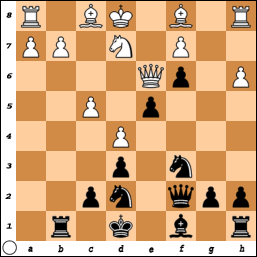 There were some random ideas that if White played Kd1 to guard the pawn, then something like Be4 Rd4 Ke7 Ba3 Rc5!? Bxc5 bxc5 would be possible, as the Rd4 is actually trapped, but it’s a bit random. The computer seems to love 20…Ke7 here, but 20…f5 as I played, just grabbing more central squares, looks pretty natural. Black will have the e4 and d5 squares, and his king will have an outlet on the kingside where White’s potentially dangerous pawns live. Some time later, we arrived at the following position. I had just played 24…Rh8, provoking 25.h3, and my original plan was to play 25…Rcg8. I originally thought that would win material, but then I realized 26.Rd3 covered the h-pawn and potentially threatens Bb4xc3. That’s not actually the end of the world, but 26.Rd3 Bc6 27.Bb4 gets rather strange in a hurry. Instead, I played 25…Rcd8. On the one hand, I wanted to dissuade him from playing Rd3 (I generally have ideas of …Ba2 or …Ba8 to try and get the d-file and leave myself with the more active rook), but I also wanted to shore up d6 because that Ba3 isn’t doing much but hoping for a chance to get to e5. Up to this point, I think Melik held things together pretty well – White’s a bit worse, but I didn’t feel like I was close to winning after a regrouping like 26.Bc1 and 27.Be3. Instead, he played 26.a5, which I didn’t totally understand but we were both getting low on the clock (he had 9 minutes left to my 8, along with a 30 second increment). I thought the open b-file was more likely to benefit me, so I just snapped the pawn up. I thought I was actually winning here, as after 33…Rg8!, I didn’t see how White was going to survive the attack. 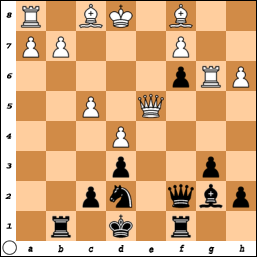 34.Rxa7 just drops the Bc5, while 34.Bxa7 Rg3+ 35.Ke2 Rd2+ and 36…Rxc2 leaves Black dominating. Meanwhile, he played the move I expected, 34.g4. Then I started a little two-step dance with the Rook: 34…Rh8! 35.gxf5 (? as it turns out) exf5 36.Rh1 Rg8!. With the g-file open, White can’t stop …Rg3+ anymore, so he tried the next best thing – prepare to block along the 3rd rank with 37.Rf1. Black has a few wins here between 37…Rg3+ 38.Rf3 Rg1 (by far the best), 37…Nd2 (hitting f1 and threatening …Nc4+) and what I played, 37…Re8. There’s no way to avoid all the threats of …Nd2+, …Nxc5+, …Ng3+ and so on. The game was wrapped up soon afterwards. However, going back to the above diagram – after 33…Rg8, White has the brilliant 34.g3!, simply giving up a pawn but forcing rooks off along the way. And after 34…Rh8, White should give up a piece with 35.Rh1 Ng3 36.Bd4! Rxd4 37.Rxa7+ and so on. 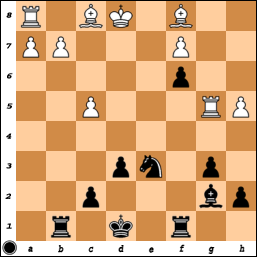 As Houdini kindly points out, White is very likely to escape into a R vs R + N endgame that is drawn. As for the other games, Yian’s generally done well for us in the league, but he struggled in this match, maybe partly (or largey) because he’s a junior in high school now and doesn’t seem to have quite as much time for chess as he did. He had lost his game before mine reached a decisive position, but then within maybe 10 minutes of my game finishing, both Danya and Siddharth polished off their opponents for a 3-1 Mechanics win. Next week we play Miami, who will get to select which color they’d like to have on Board 1 because they finished ahead of us in the regular season. Having made 3 Finals appearances, they’re one of the traditional powerhouses in the USCL, and the have actually eliminated us in the playoffs every time that we’ve faced them! So with GM (and USCL-superstar) Julio Becerra and the rest of Sharks looming in that match, the SF team will have their work cut out for them. 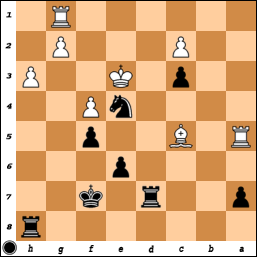 This entry was posted in USCL 2013 and tagged chess, Los Angeles, USCL. Bookmark the permalink. Welcome back by the way – you’ve been missed.